Farmers around the world are turning to nature to help them reduce pesticide use, environmental impact and, subsequently, and in some cases, increasing yields. Specifically, they’re attracting birds and other vertebrates, which keep pests and other invasive species away from their crops. The study, led by Michigan State University and appearing in the current issue of the journal Agriculture, Ecosystems and Environment, showcases some of the best global examples. In Indonesia, birds and bats provide multi-million pest-prevention services. This isn’t anecdotal, either. Indonesian cacao plantations have documented 290 pounds per acre increased yields — equaling nearly $300 per acre — from having birds and bats in their fields. In Jamaica, birds eating a nuisance coffee pest saved an estimated $18 to $126 per acre annually. In Spain, constructing roosts near rice paddies increased bat population and reduced local pests. In New Zealand, grape growers were able to, ahem, kill many birds with a single stone. The New Zealand falcon, the country’s sole falcon species, is at risk. Grape growers helped reestablish the birds in lowland grape-growing regions. 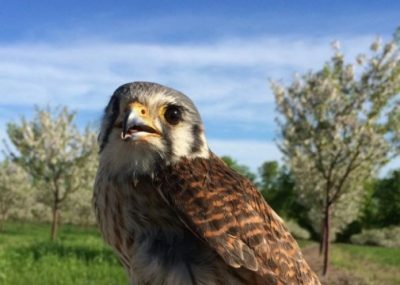 By working with the Marlborough Falcon Trust, they’re helping conserve the declining population through education, advocacy and fundraising, while protecting their vineyards. “These scientists have demonstrated a win-win situation for farmers and birds,” said Betsy Von Holle, a program director for the National Science Foundation Dynamics of Coupled Natural and Human Systems program, which funded the research. “Increasing native predatory birds in agricultural areas can help control insect pests that damage crops, potentially reducing costly pesticide use. The next steps for Lindell and other scientists are to hone in on the best practices and better measure the overall impact of specific improvements. Nest boxes, perches and making landscape enhancements that attract vertebrates work better than attracting birds through providing food resources. However, can these initiatives be scaled up for commercial farming? What’s the human cost? “Addressing these questions will increase understanding of the interactions of vertebrate predators and their prey, the ways in which these interactions provide ecosystem services and the roles of humans in protecting and encouraging these interactions,” Lindell said. “Now that we’ve bundled these studies, we really need to set a research agenda to quantify best practices and make the results accessible to key stakeholders, such as farmers and environmentalists. “My hope is that there’s broad interest in this,” she added.